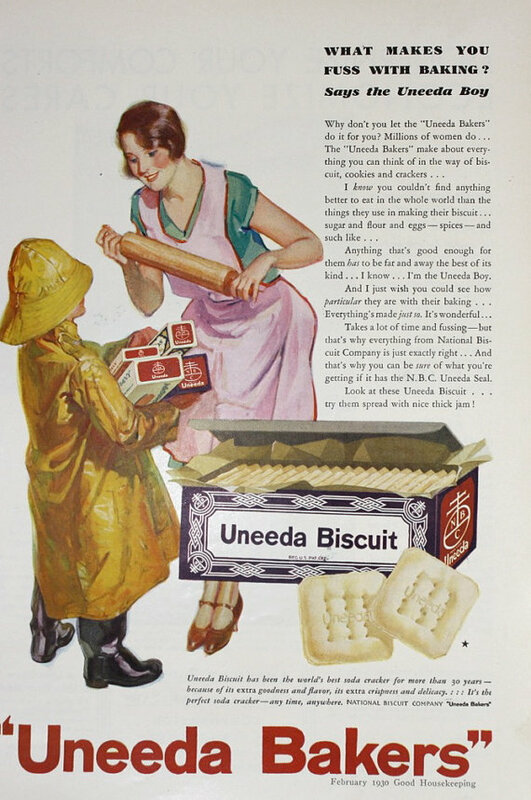 For over a century now, Nabisco products (i.e., N.B.C., National Biscuit Company) have been found in America’s kitchens. 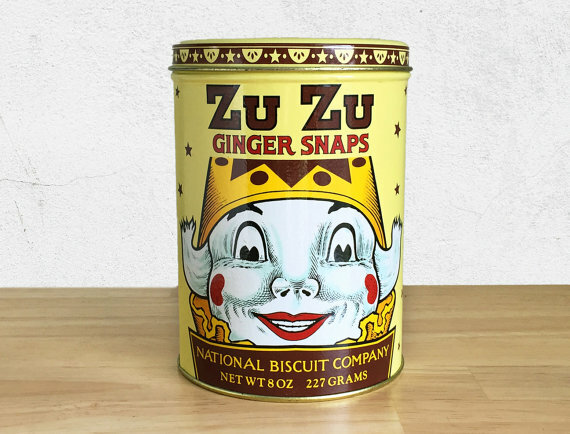 The company was formed in 1898, when a Chicago attorney, Adolphus W. Green, helped over 114 independent bakers from across the country merge into one group, which was called the National Biscuit Company. 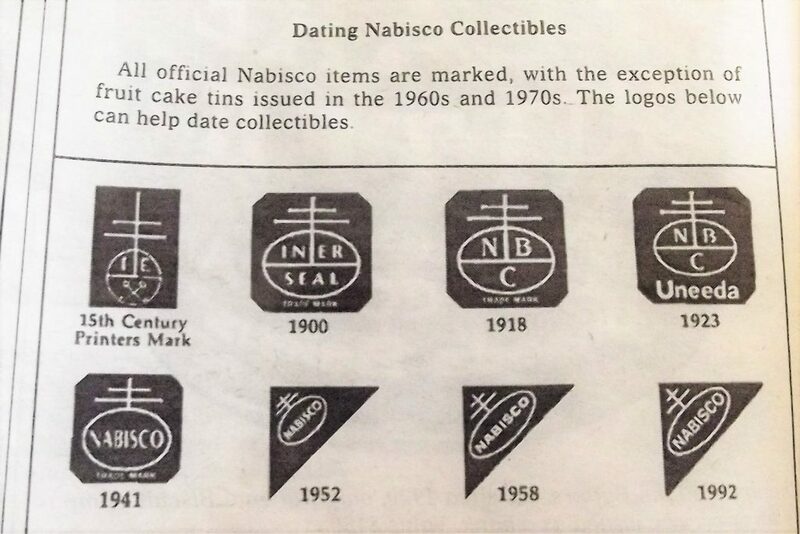 A Century of Nabisco trademarks. (Note the first mark is the 15th century Italian Printers mark. 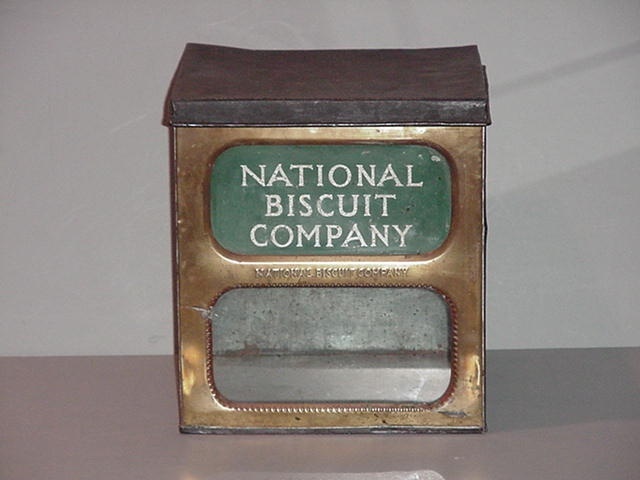 Up until 1941, the initials “N.B.C.” were used in the National Biscuit Company trademark, but were exchanged for the companies popular nickname “Nabisco” after some confusion with the Television Broadcasting Company’s (NBC) initials. 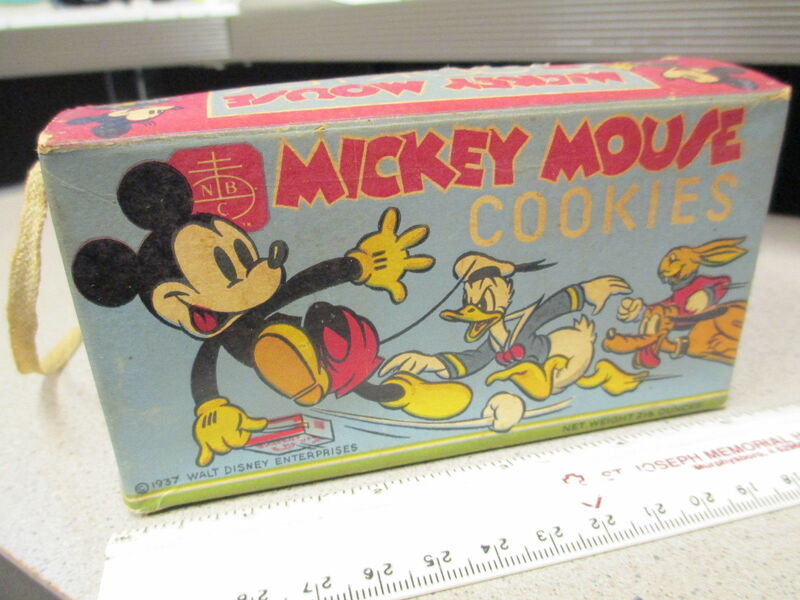 The most sought-after Nabisco collectibles are from the early 20th century. 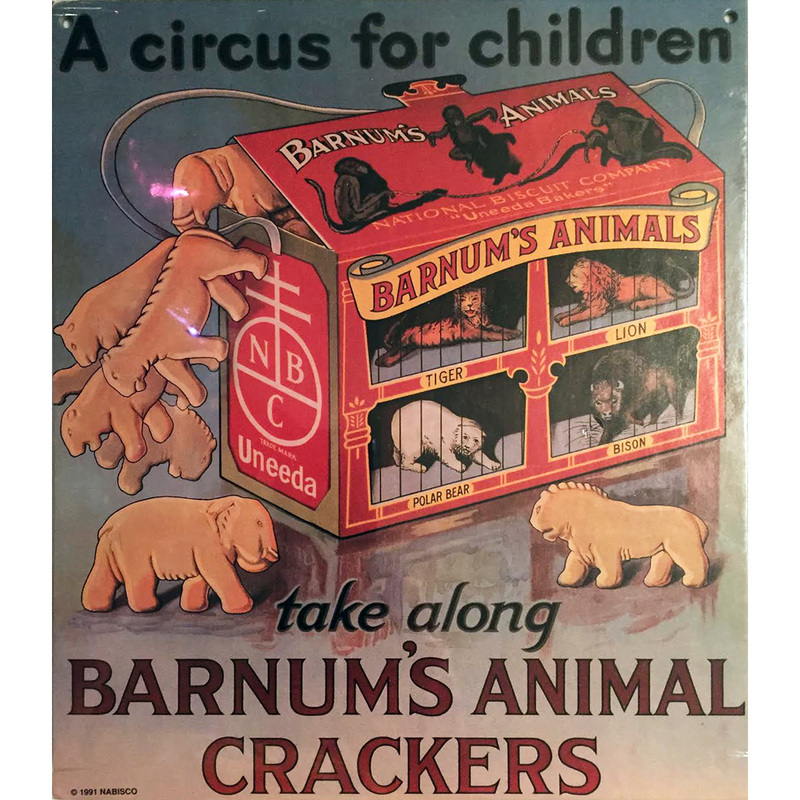 When Nabisco first started, the biscuit cookies and crackers were stored in large bins, or cracker barrels and sold at country grocery stores by the scoopful. 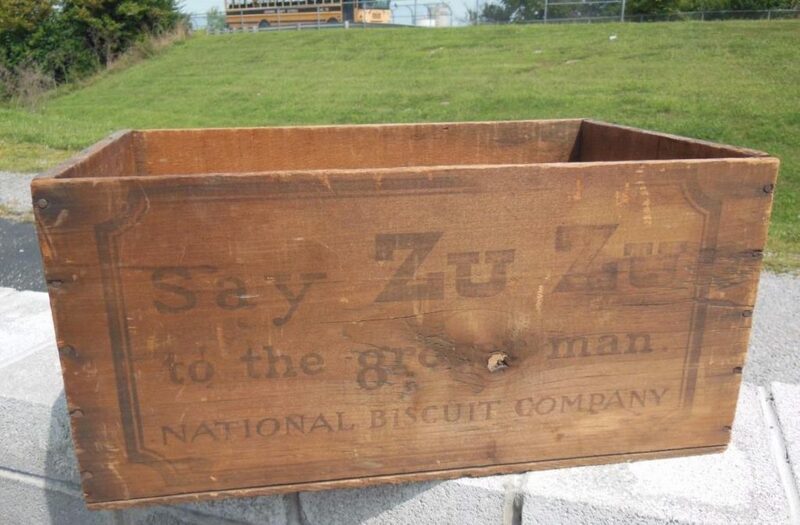 The biscuit containers and the china scoop to retrieve the biscuits, are prized along with: wood crates carrying the N.B.C./National Biscuit Company label, and early metal tins, store jars, and racks. 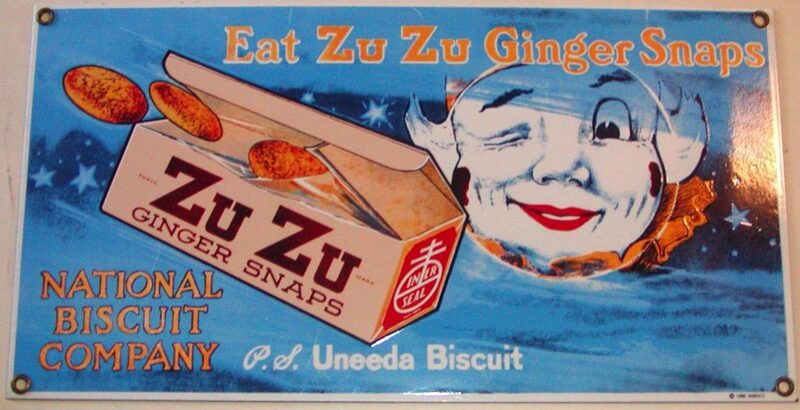 Did you know it was Adolphus Green who searched for a manufacturing company to create a more sanitary way to handle baked biscuits other than scooping them out of an unprotected bin or crate? It was N.B.C. who patented the “In-Er-Seal waxed paper lining to retain product freshness. Their packaged crackers and cookies placed in a box with a triple layer of cellophane revolutionized the food industry. 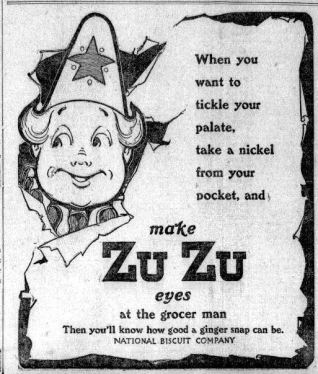 Around the 1940s, Nabisco created a few hard plastic clown (probably a take-off of Zu Zu) figural store displays on metal stands that measured 3 to 4-foot tall and came with lettered blocks sets to spell NABISCO and COOKIES. 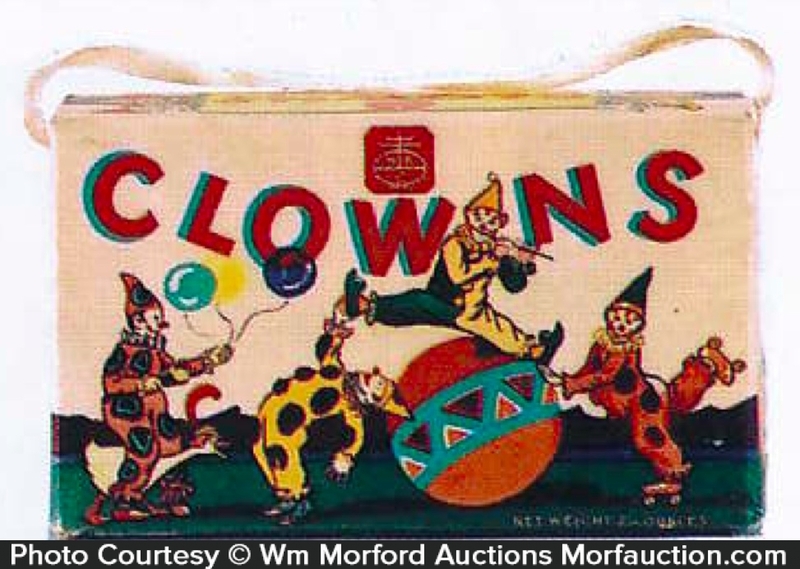 The clowns wore a silk clown-like suit in a Nabisco themed print. 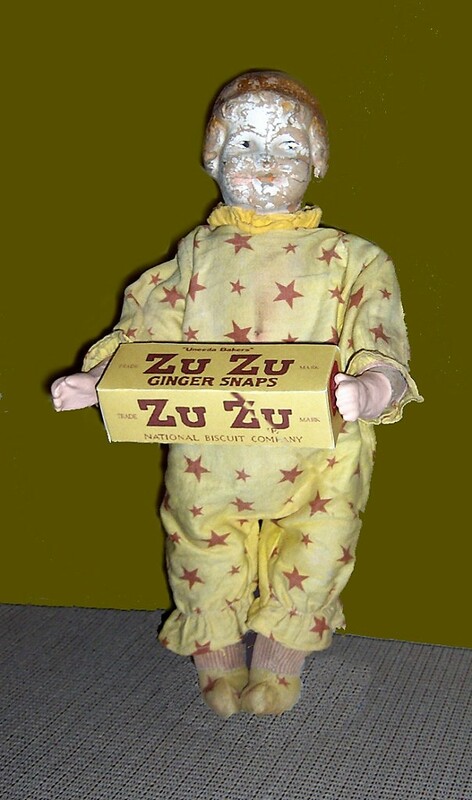 Weird and odd though are his eyes- they light up and appear to be slightly evil. 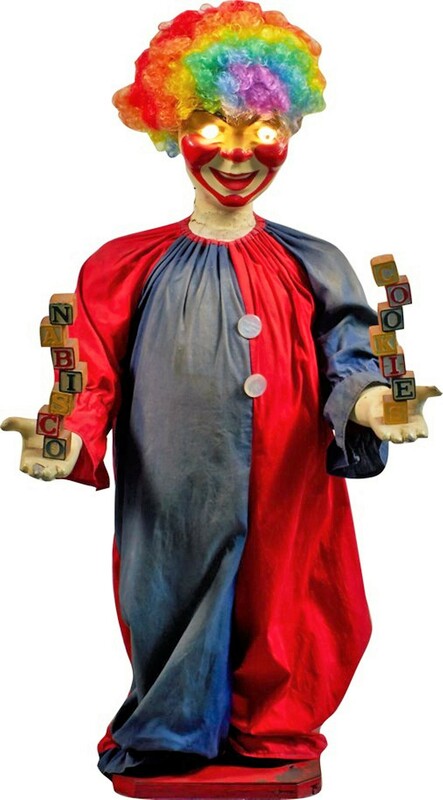 If his appearance is not scary enough; the displays were shipped around the country in wooden boxes called “THE COFFINS.” EEKS! 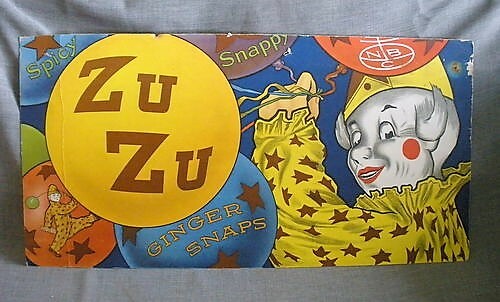 Did you know, Zu Zu Bailey in the 1946 Christmas classic movie “It’s a Wonderful Life” got her name from Zu Zu Ginger Snaps? 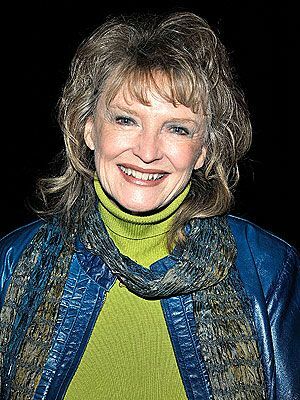 The real-life story of Karolyn Grimes was not as wonderful. She became an orphan child at the age of 15. Her mother passed away when she was 12, and three years later her father was killed in a car wreck. 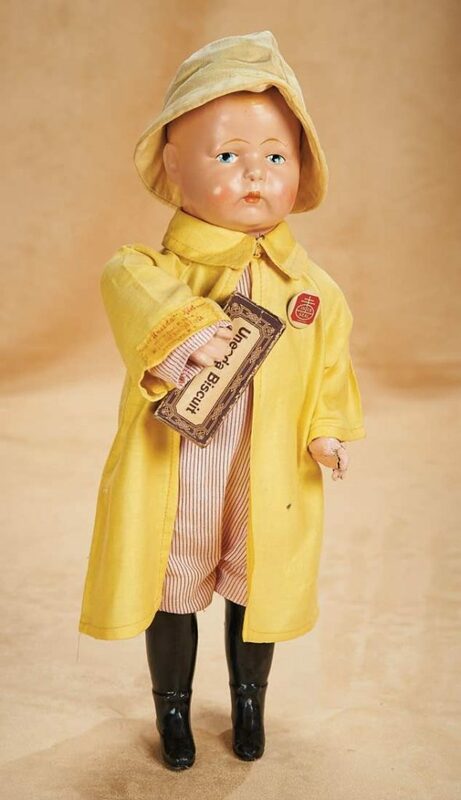 Karolyn was sent to live with her aunt and uncle who frowned upon Hollywood and TV, so ultimately Karolyn never really knew how famous the movie had become. It was Jimmy Stewart who decided to track her down in the 1980s, to join in on the movie’s ongoing popularity. 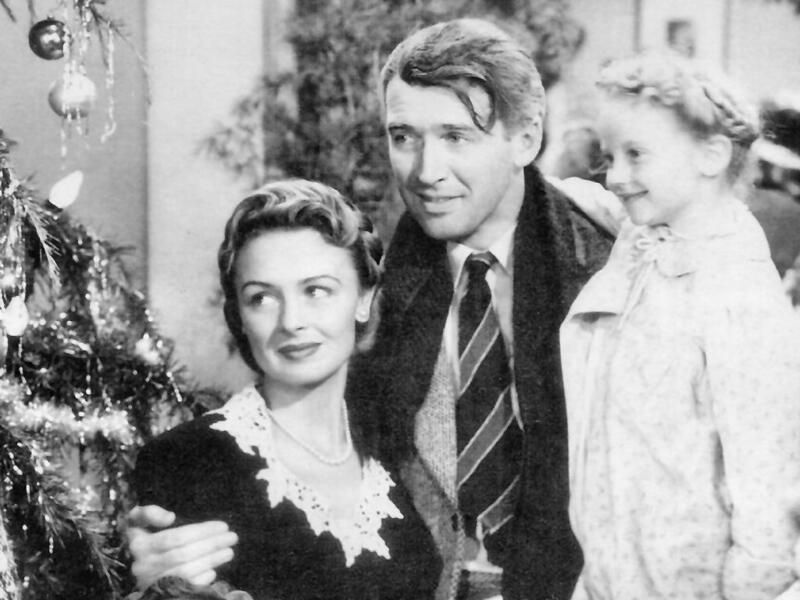 Ever since her rediscovery, Karolyn has been involved with traveling around the states to promote the real message of the film, It’s a Wonderful Life: Faith, God, and love of community.